2d Lt. Murphy commanded Company B, which was attacked by 6 tanks and waves of infantry. 2d Lt. Murphy ordered his men to withdraw to prepared positions in a wood, while he remained forward at his command post and continued to give fire directions to the artillery by telephone. Behind him, to his right, 1 of our tank destroyers received a direct hit and began to burn. Its crew withdrew to the woods. 2d Lt. Murphy continued to direct artillery fire which killed large numbers of the advancing enemy infantry. With the enemy tanks abreast of his position, 2d Lt. Murphy climbed on the burning tank destroyer, which was in danger of blowing up at any moment, and employed its .50 caliber machinegun against the enemy. He was alone and exposed to German fire from 3 sides, but his deadly fire killed dozens of Germans and caused their infantry attack to waver. The enemy tanks, losing infantry support, began to fall back. For an hour the Germans tried every available weapon to eliminate 2d Lt. Murphy, but he continued to hold his position and wiped out a squad which was trying to creep up unnoticed on his right flank. Germans reached as close as 10 yards, only to be mowed down by his fire. He received a leg wound, but ignored it and continued the single-handed fight until his ammunition was exhausted. He then made his way to his company, refused medical attention, and organized the company in a counterattack which forced the Germans to withdraw. His directing of artillery fire wiped out many of the enemy; he killed or wounded about 50. 2d Lt. Murphy's indomitable courage and his refusal to give an inch of ground saved his company from possible encirclement and destruction, and enabled it to hold the woods which had been the enemy's objective. 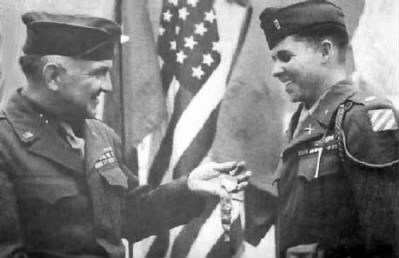 Looking for more information about Audie Murphy?